The main branch of the Chicago River has a long and storied history that in many ways mirrors the development of Chicago itself. Once a winding, marshy stream, the river first became an engineered channel to support the industrial transformation of the city. Over the last decade though, the role of the river has been evolving thanks to the Chicago Riverwalk project – an initiative to reclaim the Chicago River for the ecological, recreational and economic benefit of the city. As part of the initiative, the Riverwalk needed an improvement on its previous lighting scheme, which was dominated by stark, security-style lighting. 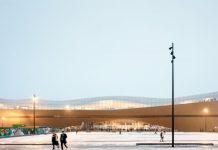 The new lighting, designed by Schuler Shook, was designed to be a drastic departure from this, instead creating something more playful, interactive and altogether more welcoming. 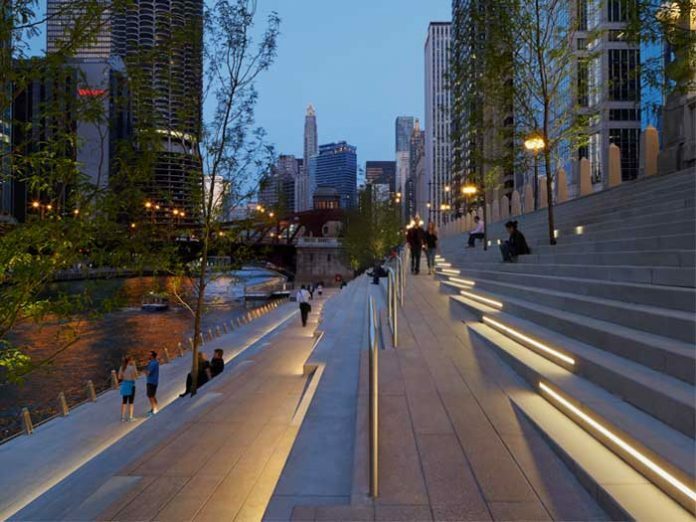 Schuler Shook was part of the team led by Ross Barney Architects and Sasaki that was selected by the Chicago Department of Transportation (CDOT) to create something special along the river. The firm typically works with the CDOT on the majority of its projects where creative and innovative lighting solutions are required. Giulio Pedota, Principal at Schuler Shook, was assigned the project internally, partially due to similar work experience that he had with the CDOT, particularly on the Navy Pier Flyover, a pedestrian bridge east of the Riverwalk. After receiving the architectural and landscape design concepts from Ross Barney Architects and Sasaki, Schuler Shook developed a lighting design that was both ‘innovative and elaborate’, according to Pedota, inspired by the ‘striking’ concepts that the architectural team drew up. “The architects had developed the concept of a series of ‘rooms’ along the river, with a unique theme for every room. Naturally, the lighting design had to respond to and reinforce these themes,” said Pedota. “The design team wanted the Chicago Riverwalk to be an attractive civic space in Chicago, where people could explore the variety of opportunities to escape, relax, play, dine, watch live performances and see the city from a new angle that hadn’t been available before.” The initial lighting designs for the various room themes included imaginative and eye-catching lighting effects such as fire, illuminated artwork, unique pedestrian poles, tree lighting, floating illuminated buoys, lighting projections to mimic moonlight, interactive lighting effects and a dramatic set of stairs for the River Theatre. Working along the tight space of the Riverwalk made the project fairly challenging from a technical point of view, as Pedota explained: “The design team needed to work within a tight permit-mandated 25-foot-wide build-out area to expand the pedestrian program spaces and negotiate a series of under-bridge connections between blocks.” Alongside this, the CDOT required that all fixtures be easily accessible for maintenance, meaning that some of the typical lighting design ‘magic’, such as hiding fixtures under benches, or concealing them in other architectural details, was not allowed. However, the biggest obstacle came when having to account for the river’s annual flood dynamics of nearly seven vertical feet. Faced with a site located in a flood zone, the lighting design called for all fixtures to be robust and rated for submersible applications, while all electrical components such as wiring, wiring splices and junction boxes needed to be rated for submersible applications too. Such precautions were ‘field tested’ a few days after the project was completed when the site completely flooded, but fortunately the decision to take these extra steps was justified, as the fixtures remained lit during the flood. Alongside the city planners’ needs, Schuler Shook had to factor in some key lighting considerations from the architects, as Pedota explained: “For the most part, the architects wanted to ensure that the lighting equipment was very well integrated into the architecture, for aesthetic purposes, but also to ensure that fixtures were protected from potential impact or harm caused by visitors. “To achieve this, fixtures [from MCI Group and LED Linear] were integrated into the handrails and benches, or were installed flush with the pavement or planter walls, or were recessed in continuous floor slots to conceal fixtures from view. As there are no IP68 rated handrails in the industry, the illuminated handrails had to be custom-made in order to meet the submersible applications. To achieve this, the handrails were fitted with 3000K, IP68 LED tape with a frosted lens to protect and diffuse the light source. In The Cove, patterns of projected tree-branches are achieved with CMH150W/T6, weatherproof, theatrical fixtures from Hydrel fitted with glass-gobos and pole-mounted at street level. While in the Water Plaza, the colour-changing LED fixtures highlighting the stone of the waterfall, along with the colour-changing fountain fixtures designed by Fluidity Design Consultants, create amusement to all the visitors, especially children. In The Jetty, the LED Linear ‘fish lights’, as the architects called the colour-changing LED lights, delineate the boundary where water meets land. Bridges linking these three ‘rooms’ were illuminated with linear LED fixtures [from MCI Group] with opal white lenses, yielding 1.8 fc average at grade. To provide safety and comfort and to improve facial recognition, fixtures were angled five degrees to provide 1.0-1.5 vertical fc, measured at eye level. The linear LED fixtures used throughout the project use 5-watts per linear foot to delineate the paths, illuminate the ramps in the River Theatre, and provide safety and comfort. 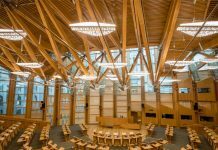 Due to concerns the Landscape Architect had with heat from fixtures uplighting the trees, 12-watt, low-heat LED in-grade fixtures were utilised to illuminate the trees. In addition, fixtures were meticulously integrated within the stairs, at a safe distance away from the trees to avoid damage to the root systems. The transformation of this site, from its former, utilitarian appearance to the bright, welcoming new look, is something that Pedota cited as ‘incredible, both from an architectural point of view and from a lighting perspective’. He said: “We were very happy with the translation from the conceptual approaches to the final results as seen in The Cove, The River Theatre, and The Jetty. “In The Cove, the idea was to create a moonlight effect through the trees, very much like we do when recreating exterior scenes in theatrical lighting. This effect was going to be the general lighting of this room, and our first impression when we saw the final effect was magical! It was recreating an exterior effect in an exterior application, which made it more realistic and at the same time unexpected, given the scale of the effect. 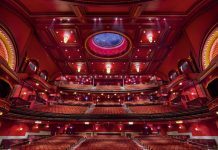 “In The River Theatre, the series of ramps were enhanced and reinforced through a series of linear LED fixtures recessed on the riser of the stairs, guiding people up and down the staircases. This, in itself, was visually stimulating. It creates a sense of order to this entire site while providing safety and comfort. Regardless of any budget-driven changes or restrictions imposed upon the project from the city, Pedota remains very pleased with the final outcome, and particularly with the reaction from the Chicago public and its visitors. “What stands out is how quickly this new space in Chicago has been accepted and welcomed by people,” he said. “Everyone is drawn to it, and that speaks volumes for how well integrated all aspects of the park are, from the lighting to the materials used to the beautiful landscaping.